Natech Risk Assessment and Management: Reducing the Risk of Natural-Hazard Impact on Hazardous Installations covers the entire spectrum of issues pertinent to Natech risk assessment and management. After a thorough introduction of the topic that includes definitions of terms, authors Krausmann, Cruz, and Salzano discuss various examples of international frameworks and provide a detailed view of the implementation of Natech Risk Management in the EU and OECD. There is a dedicated chapter on natural-hazard prediction and measurement from an engineering perspective, as well as a consideration of the impact of climate change on Natech risk. 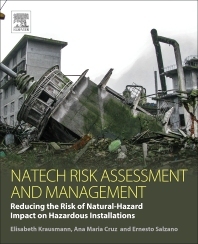 The authors also discuss selected Natech accidents, including recent examples, and provide specific ‘lessons learned’ from each, as well as an analysis of all essential elements of Natech risk assessment, such as plant layout, substance hazards, and equipment vulnerability. The final section of the book is dedicated to the reduction of Natech risk, including structural and organizational prevention and mitigation measures, as well as early warning issues and emergency foreword planning. Elisabeth Krausmann is a Principal Scientist with the European Commission’s Joint Research Centre (JRC). Having a Ph.D. in nuclear physics, her research experience includes risk analysis of natural-hazard impact on hazardous installations, nuclear-reactor safety, severe-accident management and consequence analysis. Since 2006 she leads the Natech activity at the JRC which focuses on the development of methodologies and tools for Natech risk analysis and mapping, accident analysis and lessons learning, and capacity building for Natech risk reduction. She is a Steering Group member of the OECD WGCA’s Natech project. Ana Maria Cruz is a Professor of Disaster Risk Management at Kyoto University. She received a Chemical Engineering degree in 1987, and worked in industry for over 10 yrs. She later obtained a MSc. in Applied Development and a Ph.D. in Environmental Engineering from Tulane University where she pioneered research on Natechs from 1999. She has worked in the private and public sectors, in academia and with government at the local and international levels in four continents. Her research interests include area-wide Natech risk management, risk perception and protective behavior in communities subject to Natech and climate change impacts. She has published over 40 journal articles and several book chapters, and serves as an Editor for the Journal of the International Society for Integrated Disaster Risk Management. Ernesto Salzano is Associate Professor at the University of Bologna since 2015. His main research activities are in the field of industrial safety. In particular, he studies risks related to the use of flammable substances and risks to critical infrastructures from external hazards, such as Natech risks, domino effects from explosions, and security risks due to intentional acts (terrorist attacks and sabotage). From 1995 – 2015 Prof. Salzano was a researcher at the Institute for Research on Combustion at the Italian National Research Council where he was in charge of the laboratory for studies on substance explosivity and flammability at high pressure and temperature.